001. As I type this I am on a walk home from my latest run. Boy am I unfit right now. I'm off on out annual family holiday in 8 weeks and I need to tone up my problem areas (tummy and arms!) and get back into shape. It's actually really nice to go running in the evenings as the weather is so lovely. Paired with the fact that it gets dark so late now it's nice to take advantage of the two huge commons that I live between! Ive also started personal training which is a bit different from how I've ever trained before but I'm enjoying it so far! Having someone motivate (and shout!) at you is surprisingly encouraging! I said last week I was going to start the 5:2 and I had a few people ask me about it but it just doesn't suit my lifestyle as I exercise too much to eat 500 calories some days. It just wouldnt work long term, although my flatmate and mother are doing it and have seen really good results so far! 002. On Saturday I went to a vintage kilo sale called Seek and Revive which was really good. It was basically a huge space filled with vintage clothing and you paid for it per kilo of clothing you bought. Each kilo was a mere £15 and I ended up getting 4 tops for £7.50 (me and Dal paid together so it was cheaper). Then we went to Brick Lane for beigels and then went to Wagamama for food. It was a really chilled out weekend actually and I've really enjoyed not going out and nursing hangovers! 003. It's been quiet on the beauty blog front the past few days as Im feeling a bit underwhelemed by beauty products at the moment. I havent had anything the last few weeks that's really wowed me or made me stop and think I need to share this. Apart from obviously me getting my paws on Estee Lauder Bronze Goddess after a very long wait! Maybe its that awkward part between Spring and Summer makeup where I need to wait a little bit longer to start getting excited by summer collections! 004. I literally can't stop humming Get Lucky by Daft Punk featuring Pharrell. Such a good summer tune! I've shamelessly been listening to it on repeat all week! I might start making Spotify playlists of my favourite songs and share them on here! Ive been meaning to do it for ages but I haven't got round to actually publishing them! I love your dress so much!! i need to start getting in shape - especially if i want to go on holiday and whack out the ole body! The vintage kilo sale sounds amazing ! so lucky for you to be going on a holiday, i am wanting to go but i can't find anyone to go with me, very sad :( can i come with u? So I guess we can expect some OOTN on vacation? Like the Instagram ones you did last time! That would be lovely! Nice outfit and that dress looks amazing. thanks for the music introduction, I am now hooked on this song! Love the dress, so adorable! I've been repeating get lucky too, i prefer it without the vocals though and found an hour long loop of just the funky beat. Good luck with the running, I never have enough motivation to take up exercise. I go through phases to get fitter but it only lasts a few days so having a personal trainer sounds like a pretty good motivation booster. love the jacket! i'm still not over the camo trend! 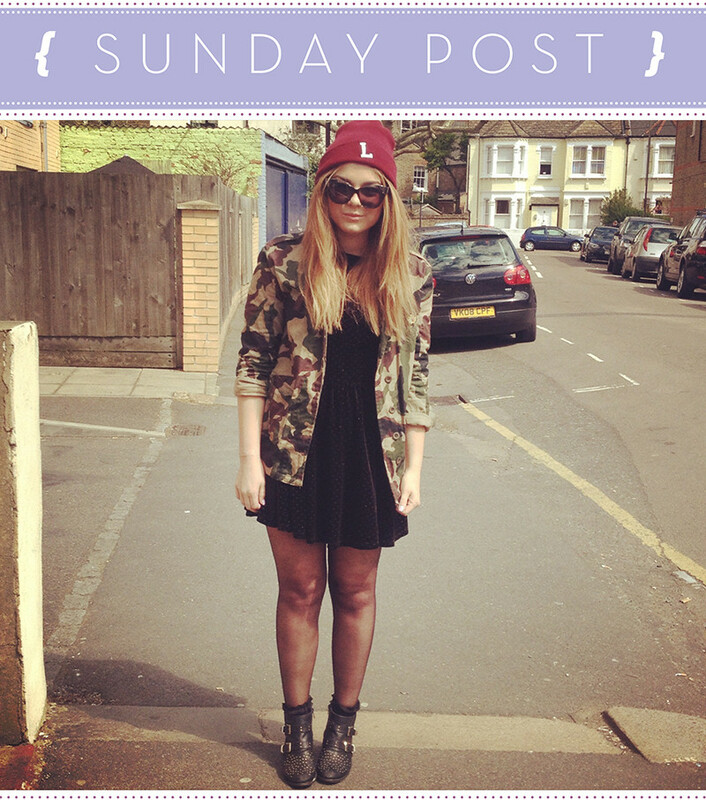 Loving the camo jacket and hat lovely! Swoot Swoo!! Adoring the hat - you look an absolute gem. Great combo, dress and jacket - beaut. Think I need this dress in my life. Cute outfit, i'm so jealous that you get to go on a family holiday! i love this look! especially the army jacket in combination with the burgundy beanie! aw, im trying to get back into running too, i think everyone in london is desperatly trying to tone up asap after weve had a few nice days! The outfit really suits you. and abut training good for you for starting it up, It has always be one of those, ill do it later things with me. This is inspiring, dresses with that kind of blouses/jackets always look so pretty on everybody, but on myself I don't like it. Maybe I should give it a shot.